Maine architecture has a storied past. In Portland alone, buildings range from the Colonial Tate House (1750–1820) to the Renaissance Revival United States Custom House (1868–72) to the postmodern Portland Museum of Art addition by Henry Nichols Cobb of Pei Cobb Freed and Partners (1983). For a variety of reasons, design evolution often means buildings that were once “in style” aren’t anymore. 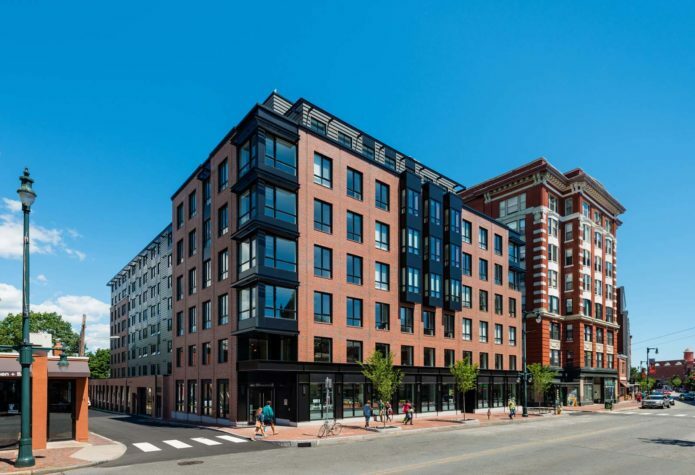 And whether or not you deem a particular building beautiful, what there’s certainly no arguing about is that Maine architecture continues to evolve at a rapid pace. The projects range in scope—from a contemporary residence with a planted flat roof to a three-story urban penthouse to a 19,000-square-foot office building for an insurance company—but what is notable about many of them, as architect Scott Blanchard of Eric A. 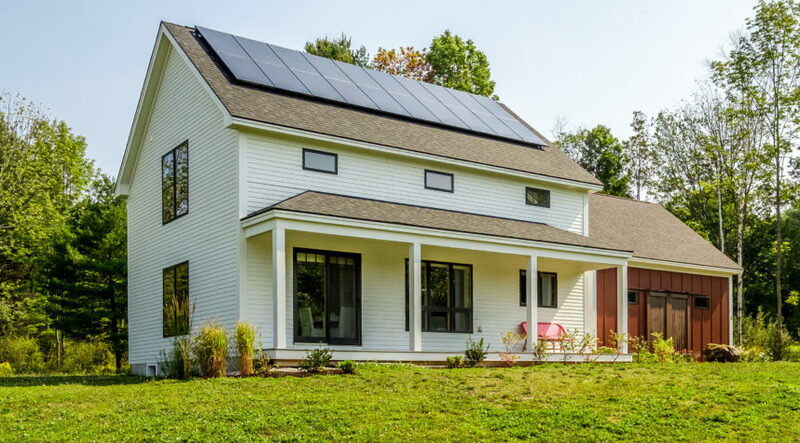 Chase Architecture puts it, “is what you don’t see.” The firm updated a turn-of-the-century farmhouse with solar panels that store summer’s excess energy to be used during winter’s sun-shy months. 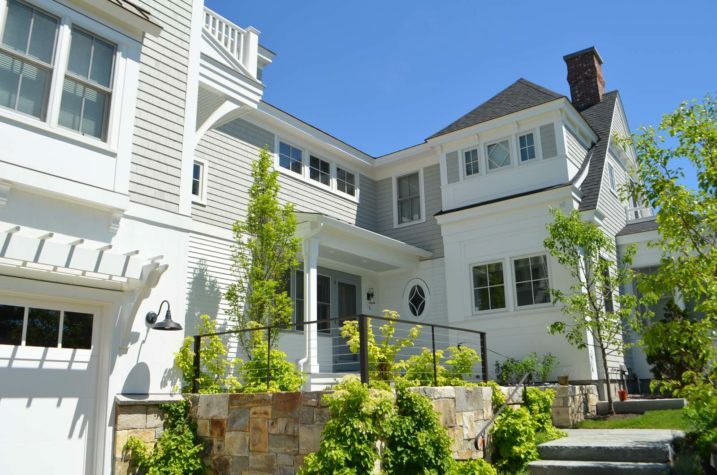 Indeed, sustainable design strategies are used in abundance: Fiorentino Group Architects planted a fine fescue lawn that requires less water, and BrightBuilt Home constructed an entire house off-site—both saving on the cost of construction and saving the home from the elements while it was built. These projects speak to a level of sustainability that simply wasn’t possible just years ago. What will Maine architecture bring in the coming years? If the following pages offer a glimpse of where it’s going, if they serve as a roadmap to the future being built around us, then we’re on the right path. In color, form, line, shape, space, texture, value, and scale, these projects are making their artistic, imaginative, optimistic, and indelible marks on the state. Here’s to making beautiful history. These repeat clients had an existing Cape-style house that did not take advantage of its spectacular views to Goose Rocks Beach. One of the challenges of the property was a zoning restriction that said that, if the entire existing house were to be tore down, the new house would have to be quite a bit narrower on the ocean side, thus restricting the views. 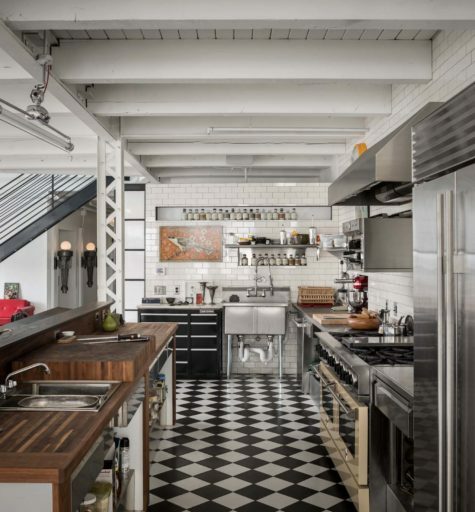 Architect Brian Beaudette solved this by keeping the basement and tearing down the rest of the old house, which retained the grandfathered width. “While the homeowners had amazing vision and knew exactly what they wanted, sometimes this vision needed to be pulled out,” says Beaudette. Like so many seaside residents, the clients enjoy hosting lots of guests and wanted to be able to comfortably accommodate them. 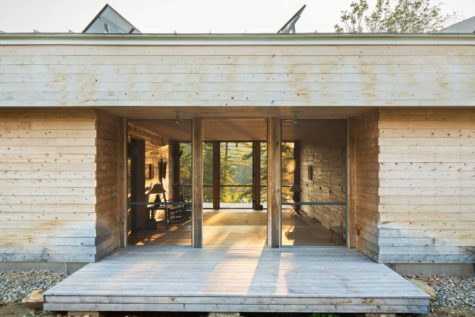 Beaudette accomplished this by creating five en suite bedrooms and three getaway spaces. Other requests included preserving a sitting spot on the covered porch that faces the ocean and fine-tuning the mudroom/laundry area. The house has roll-down screens on the covered porch, spray-foam insulation throughout, high-efficiency mechanical equipment, and PVC trim for easy maintenance. The resulting quintessential coastal home is perched on a sand dune, and now overlooks magnificent Goose Rocks Beach from most rooms—all while being able to accommodate lots of guests. 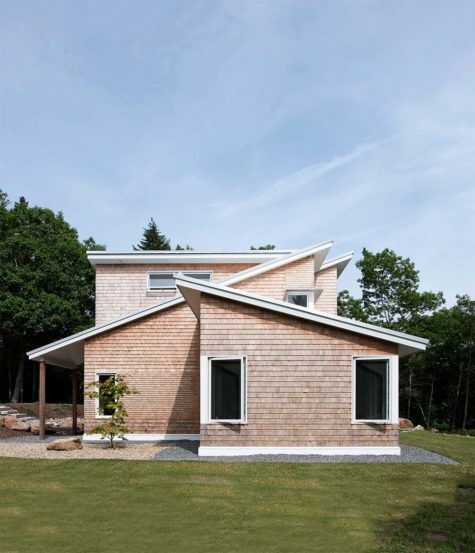 Located at the edges of diverse environmental conditions—sea, meadow, and forest—this house is divided into three distinct volumes designed to engage the site both visually and phenomenally. The shed-roofed masses are arranged for interaction with family and friends or for seeking refuge as needed. While each of the structures is oriented to the water, the shifting of the masses allows each to capture unique views of the site as well as other parts of the home. This has the effect of creating microclimates that offer not only views but shade, sun, or wind as well. Flat-roofed breezeways provide connection and separation, linking the owners’-bedroom, living, and guest wings of the house. The result of this uncoupling of functions allows different zones of the house to connect with different aspects of the site. The owners’ bedroom sits back on the site for privacy. It has a water view but also abuts the forest edge, which provides screening and a sense of enclosure. The living wing fronts both the water and a two-sided courtyard, conditions that allow for gathering in either shade or sun as desired. The guest wing is perched above the meadow, projecting into the view but oriented to the east, toward the morning sun and away from central activity. The apertures of the house follow this site/privacy dictation, with the water-facing facades more transparent and permeable, to capture both light and coastal breezes; the remaining elevations have more strategic openings for cross-ventilation and framed views of meadow and forest. 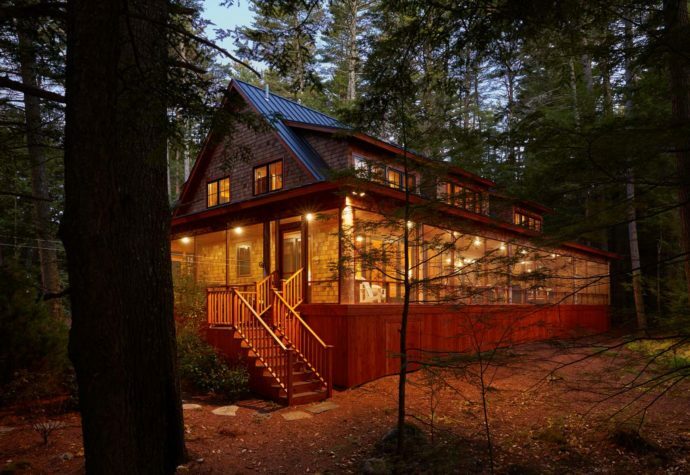 A family living abroad wanted a new home in Maine that could replace the home they’d occupied on previous regular trips back to the States. The goal of the home was to connect them to the history and majesty of the location on Coombs Cove, a tidal inlet of the Pemaquid River. The setting, located close to granite bluffs and surrounded by old-growth pine and fir trees, offers a distant view of Fort Charles at the Colonial Pemaquid State Historic Site, one of the earliest sites of European occupation in North America. 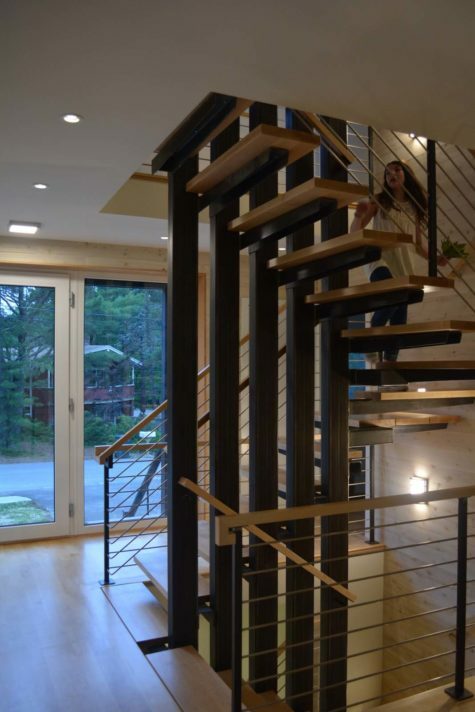 The family also wanted the home to be as energy efficient as possible, capable of achieving net-zero energy. It would house an aging parent who would serve as a year-round caretaker, so it needed to be safe, efficient, and easy to maintain. Finally, they dreamed of a protected outdoor kitchen that could easily accommodate the frequent, large-scale, and complex Thai meals they love to cook for friends and family. The modest home lives large thanks to lots of triple-glazed ventilating windows that connect the indoors to the natural setting outside. The glass also helps to reduce the costs of operating the home, bringing heat costs down and allowing the family to achieve net-zero energy with fewer solar panels. 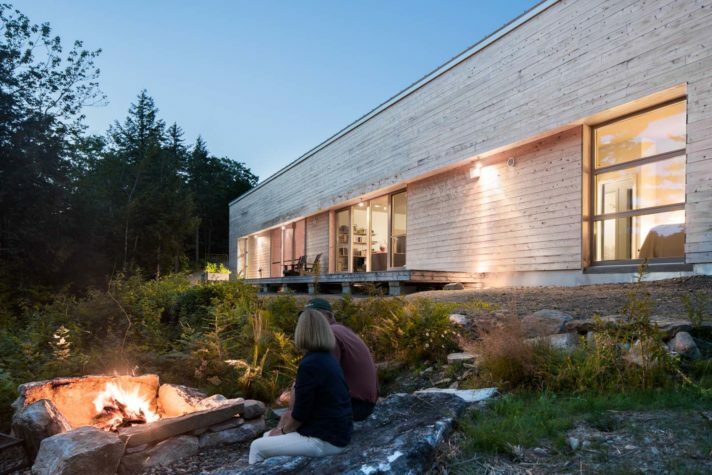 The eastern white cedar shingles used on the home’s exterior were locally grown and sourced, providing a durable, attractive, and naturally rotresistant siding material that will last in this wild coastal environment. An open plan with two-story spaces connects the floors, and a glassy, cantilevered portion of the bathroom off the owners’ bath provides a peaceful, unique experience, floating within the patio roof, in the trees and above the water. The bedrooms are deliberately small, because the family does not plan to spend much time there, but their views are absolutely tremendous. Simplicity of form was the primary design objective for this contemporary dwelling that was built on a very limited budget. “At its most basic, the house is a shoebox,” says Will Winkelman, describing the shape of a long, thin rectangle with a flat roof. A pop-up second-floor shed roof catches daylight from the south and throws it down into the public spaces. The house is perched on the edge of a ravine overlooking a freshwater stream that flows into a tidal river, so the view changes dynamically through the day. The plan responds to the site as a “bar house,” or a single-loaded rectangular form, with every room offering a view of the ravine and tidal river. The entry is on the public/car side, with the entry axis crossing through the house and looking back out to nature and to the river view. The flat roof was planted to soften the otherwise hard form. The effect of the living roof lifts the landscape up, onto, and over the building. A high-performance building envelope and systems were priorities for the owners and were achieved while respecting budgetary considerations. In addition, simple materials were used in different unique ways, delivering a low-maintenance exterior. Mottram Architecture designed this farmhouse to have a symbiotic relationship with the sun and the surrounding environment. 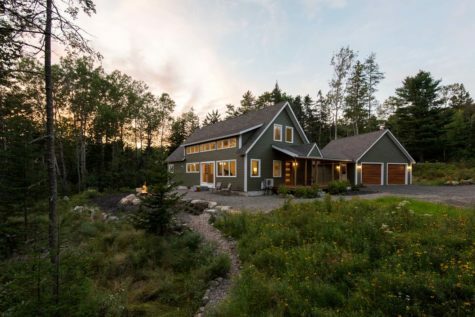 It is a net-zero-ready home with a Home Energy Rating System score of 10, built by Live Solar Maine. An additional row of panels, planned for in the solar design, would put this house at below-zero energy consumption with positive solar output and the accommodation of an electric vehicle. Careful consideration was given to optimizing sunlight, energy, and air quality through the use of daylight planning and by tracking the sun’s movement and the homeowner’s habits across the house during the course of a day. The house faces south to take advantage of passive and active solar gain. 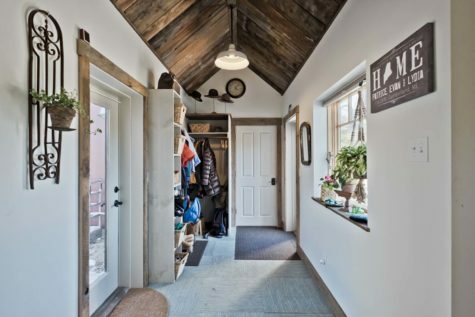 In the summer, a farmer’s porch blocks out stronger sun, while light from the south and west warms the home in the winter. North-facing windows were minimized for performance. A New York couple looking to relocate closer to family in Maine purchased a wooded ten-acre lot on the shores of the Royal River in North Yarmouth. The goal of the architect, Briburn, was to design an energy-efficient home and artist’s studio capable of reaching a net-zero energy goal. The buildings are sited to create visual and acoustic separation while maximizing views east to the river as well as southern orientation for both natural light and heat gain in the winter. The firm worked with a landscape designer and the owners to develop a series of public and private exterior spaces, including auto courts, walking paths, patios, and gardens, that contrast yet harmonize with the landscape. The home features 12-inch-thick double-stud exterior walls filled with dense- packed cellulose, triple-glazed windows and doors, 4 inches of rigid insulation beneath the concrete slab foundation, deep roof overhangs to control light on the south side, a highly efficient gas-fired boiler, radiant in-floor heating, and an energy-recovery ventilator to circulate fresh air. Photovoltaic panels on the roof of the artist’s studio are designed to offset all the energy demand for that building as well as the home. Taggart Construction used tapes and sealant to create a tight building envelope that earned a reading of 0.85 ACH50 (air change per hour at 50 pascals) during the final blower-door test, indicating minimal air leakage. The exterior finishes were chosen for their natural beauty and low-maintenance properties and to blend with the earth tones found on-site. Locally harvested, thermally modified poplar, which requires no paint finish and is termite and rot resistant, was used for the siding, and the trim around the aluminum-clad wood windows is a poly-ash material. Both the windows and trim are painted dark bronze to create a unified appearance. 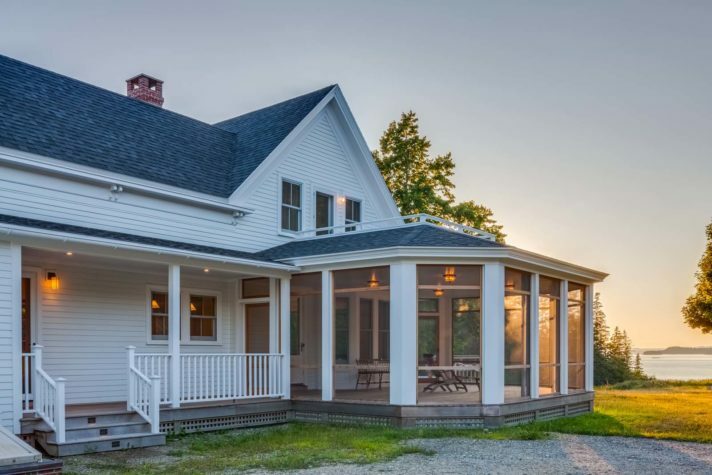 At first glance, the renovation of this Deer Isle home might seem skin deep, but “it’s what you don’t see that sets this 100-year-old farmhouse apart,” says architect Scott Blanchard of Eric A. Chase Architecture, who designed updates that harmonize with the simple vernacular style prevalent throughout Maine. The redesign opened up the first floor and included a new connector to the barn from the ell and a new 14-foot bay window to enlarge the living room and enhance its ocean view. Outside, Chase designed an octagonal screened porch with a second-floor deck that wraps around the home’s northwest corner. “Each new element flows from the existing design and honors the original architecture,” says Chase. 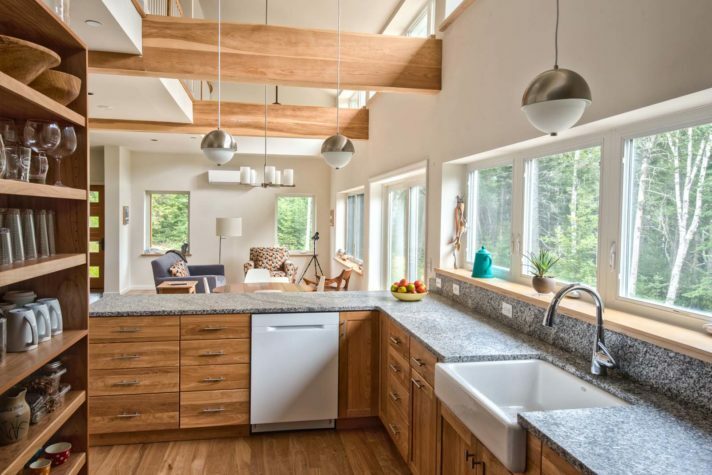 Blanchard, working with the client, who is a committed environmentalist, developed a design to retrofit the farmhouse with new energy-saving technologies. After furring out the walls, the walls and roof were insulated with 5 inches of Corbond spray foam. A Daikin Altherma air-to-water heat pump system supplies low-temperature radiant hot water and heating throughout the house. In the barn, nail-base panels insulate the exterior walls and roof, and two Fujitsu mini-split air-to-air heat pumps stabilize the temperature. An energyrecovery ventilator circulates air within both the house and the barn. On the roof, a 7-kilowatt grid-tied solar electric array supplies electricity to run the heat pumps and ventilation as well as for other electrical needs, and the grid stores summer’s excess electricity for winter’s sun-shy months. Visitors to the site don’t see any of the energy system equipment, but the client quietly knows of her contribution to the environment. “This was an opportunity for our firm to design an urban dwelling for a restaurant owner with lots of ideas and distinctive tastes,” says architect Caleb Johnson of Caleb Johnson Studio. Designing a three-story penthouse with a large rooftop deck and plenty of room within the unit gave the firm a chance to make a sculptural statement out of the staircase. The owner’s experience and love of cooking is evidenced in how the central kitchen has the feel of a professional one. The bathroom is designed to be an experience, featuring a full glass wall and a vanity made from a dining table cut in half. 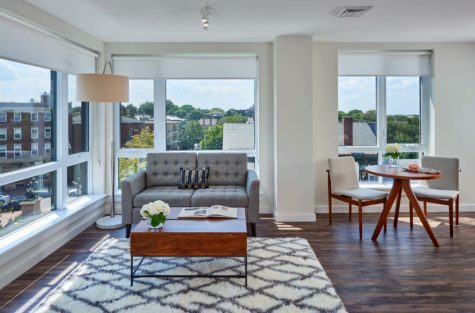 Designing with excess space was a new experience for the architects, and it allowed them to experiment with features such as an oversized owner’s closet big enough for furniture and a living room large enough to allow for many alternative furniture arrangements. One of the defining features of the living room is the streetlights that the owner found at an architectural salvage dealer in Chicago. “Overall, the success of the project affirms that a great project requires an exceptional owner,” says Johnson. Located on a remote site in Palermo where connecting to the power grid would have been uneconomical, this slick, minimal, and net-zero retreat designed and built by GO Logic offers its owners all the comforts of home—at a cost that didn’t break the bank. The house occupies a narrow shelf of land along the shore of a secluded pond. Responding to the site’s north–south orientation—less than optimal for solar power—GO Logic gave the building a simple, boxlike form topped with a finlike array of photovoltaic panels. Mounted in eight parallel rows across the building’s long axis, the panels are as integral to its aesthetic as they are to its function. The standing-seam metal roof spans a two-car garage at its north side and 1,100 square feet of conditioned living space at its south. Reflecting the owners’ minimalist lifestyle, the house’s interior spaces are compact and space efficient, but large windows and glass doors enhance their sense of volume. A screened porch, which is bracketed near the center and offers a view through the building to the pond, serves as the main entrance. It adds flexibility, serving as an al fresco living room during the warmer months; with the addition of fitted storm panels, it can be used well into the spring and fall. Closets in the house’s unheated areas and a large, easily accessible attic minimize the volume of interior space devoted to storage. The building’s 24 photovoltaic panels generate 6.7 kilowatts, enough to satisfy everyday electrical needs. Sixteen deep-cycle batteries store surplus electricity, while a small propane generator provides backup and emergency power. The house’s super-insulated, air-sealed Passive House building shell and triple-glazed windows and doors—along with passive solar gain from the bedrooms’ south-facing glass—reduce the demand for supplemental heat so that it can be supplied by one small propane heater. The overall design lets the owners live the good life—far beyond the last power pole. The clients came to Whitten Architects looking to replace a worn 1930s cottage with a new contemporary, day-lit, energy-efficient vacation home. It also needed to provide amenities for their extended family and friends. Located on a frontal dune, this house would be constrained by the height limitations of the town and the FEMA floodplain of the beach. Whitten Architects worked closely with William Walsh of Walsh Engineering Associates to create a code-compliant path to maximizing occupied space while keeping the building in line with its surroundings and complementing the neighborhood aesthetic. Needing to set the structure 11 feet above the street for flood purposes, Whitten Architects worked with Albert Putnam to create an evocative language of exposed galvanized steel structure that would tie the building to the ground with a light and airy touch. 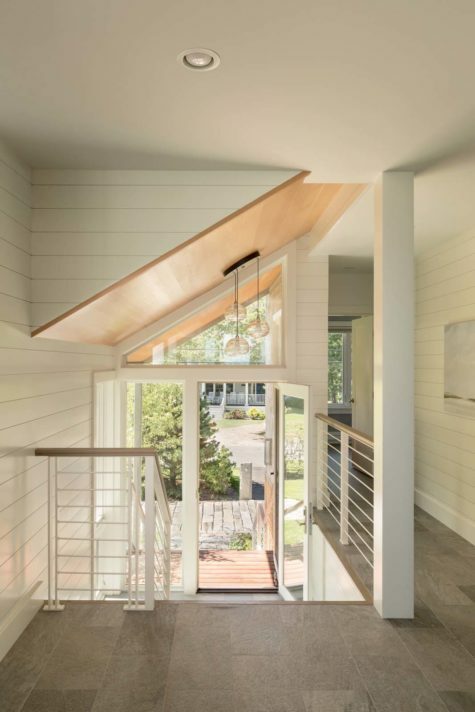 The galvanized steel is repeated throughout the house on the exterior entry stairs, water table, and exterior porches, tying the building to the land and creating a contemporary interpretation of a beach cottage. Large, comfortable processional steps provide a gentle arrival through the house and down again to the beach, making the house a permeable bridge between the outside world and the beach. Once a visitor ascends the steps and enters the house, the view changes from structure, screening, and street to beach and open ocean. The sound of the rolling waves that pervades the house creates a constant sense of serenity. Expansive glazing embraces the view and connects the occupants to the outdoors. Landscape architect Emma Kelly’s landscape rolls around and through the lower level of the house, slipping underneath the exposed steel structure and continuing to blur the line between indoor and outdoor spaces. The building seeks to minimize energy consumption through an insulated shell, daylighting strategies, and cross-ventilation. A large solar electric array works to offset the energy consumption in the building. View-driven decks extend the living space toward the beach. They provide needed shade in the summer and a commanding overlook of the beach below. These spaces create the perfect respite after a day at the beach. The desires to attract a younger workforce, to create a more modern, flexible, and sustainable work environment, and to plan for the future led a growing insurance company to relocate to Portland. 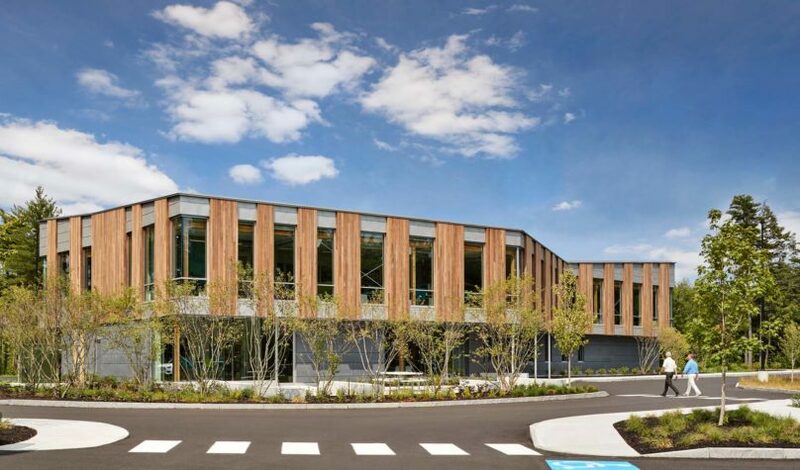 Scott Simons Architects designed a 19,000-square-foot office building for Patrons Oxford Insurance Company in Portland Technology Park to support the company’s mission and long-term goals. The building is based on a simple planning layout of three 20-foot-wide structural bays, with the center bay opening at the main stair to allow daylight to flood the interior. The two-story building takes advantage of the natural setting of the park. Public meeting areas are on the first floor, including the “collab cafe,” a boardroom, and a training room for 65 people. The first floor also has a large fitness room and direct access to the gardens and the park’s trail system. All primary work spaces are located on the second floor, with views out to the exterior in all directions. Inside, the building is designed to have a feeling of spaciousness and connectivity. There are eight private offices, but workstations are arranged in an open office format. Meeting rooms provide opportunities for privacy and group work sessions, including “solo” rooms, small meeting spaces, and larger conference rooms. Employees are encouraged to meet in the collab cafe with their team and a cup of coffee. 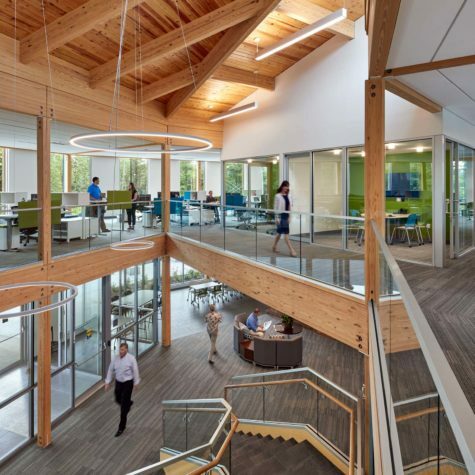 The rhythm of the windows and heat-treated wood panels creates a visually stimulating fenestration while generously flooding the interior work environment with light. The lower floor has a broader rhythm of windows and more solid, stone-like panels differentiating the less occupied support spaces from the more transparent common areas. The building uses a mass-timber framed structure with glulam beams, columns, some structural steel reinforcement, and wood roof decking. More traditional light wood framing is used to frame floor and roof plates, shear walls, and partitions, but the primary frame is left exposed throughout the building, which highlights the natural beauty of the material and the value of a renewable, carbon-sequestering structural system. Designed to outperform energy codes by 30 percent, the building exceeds this target with its R-35 exterior walls, R-48 roofs, R-10 slabs, U-0.27 windows, heating and cooling provided entirely by heat pump systems, daylight and motion sensors, and energy-recovery ventilation. It also incorporates a 29-kilowatt rooftop photovoltaic array, with ground-mounted photovoltaic arrays planned to further reduce energy costs. 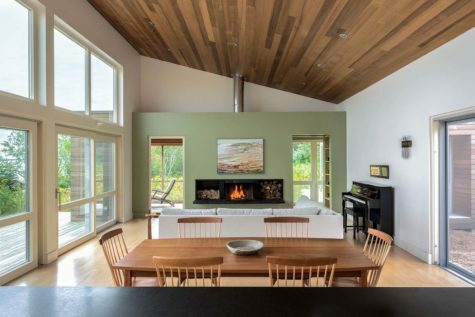 This lakeside home designed by Kevin Browne Architecture is heavily influenced by the idea of a summer camp in the Maine woods. The clients’ family has been on the lake since the 1910s, and the design intent was to create a timeless home that melts into the landscape. 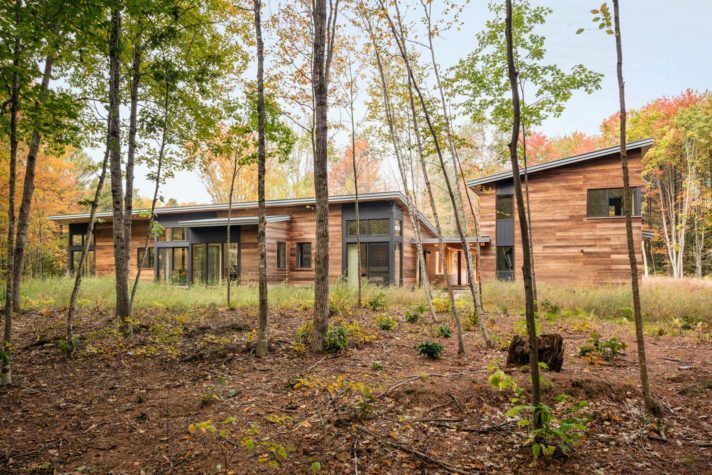 The home itself is nestled into the surrounding woods, while the materiality is almost exclusively wood. Views of the lake are maximized with a wraparound screened porch, while unfinished live-cedar columns pull the site indoors, blurring the line between interior and exterior. In the summer, sliding porch doors that run 40 feet long are left open, to extend the living space, while an outdoor kitchen is used year-round. The adjacent buildings—a garage with overflow space and a bunkhouse (converted from the original garage and designed by the clients)—are both clad in matching cedar shingles to unify the site. Kevin Browne Architecture sited the home in order to minimize impact on the lot and reduce the removal of large pines. The trees that did need to be cut down for construction were repurposed into the flooring of the home. 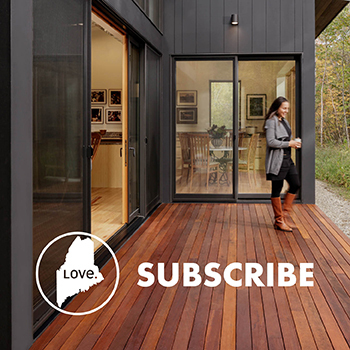 Many of the elements in the home are manufactured and designed by Maine companies and artists, bringing the Maine spirit into the fabric of the home and site. 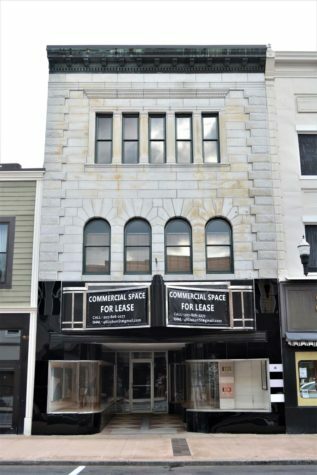 The rehabilitation of 46 Lisbon Street in Lewiston demonstrates the influence that small-scale redevelopment can have in revitalizing historic downtowns. The building was constructed in 1895 and was added to the National Register of Historic Places in 1985. Despite the neglect suffered by the building over the past few decades, the iconic granite and black glass facade continued to stand as one of the more significant small commercial buildings in downtown Lewiston; with this rehabilitation, it has returned to its former glory. Rehabilitating the upper floors of the building, which had been vacant for at least 40 years, proved to be both a challenge and an opportunity. Despite being in poor condition visually, the superior building materials used a century ago were remarkably intact. Their reuse was simply the best option both financially and for longevity. The end result is a project that simultaneously highlights the historic character of the building yet is unmistakably modern. Converting the interior from its previous office use to residences required certain modifications, but the design prioritized maintaining the interior’s historic character. Floor plans were changed minimally. 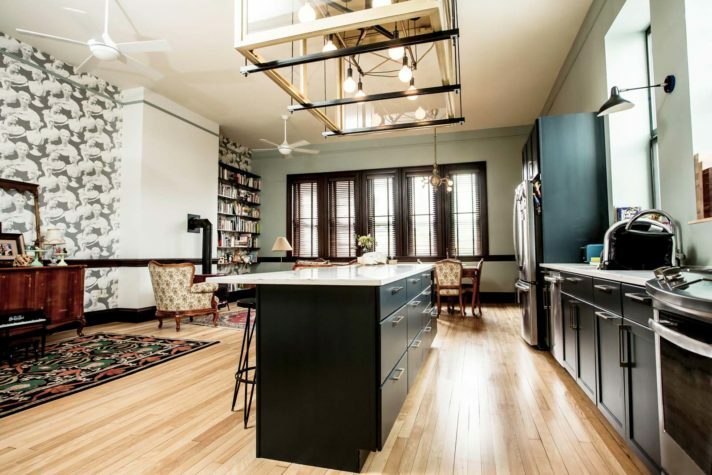 Doors, windows, and openings were preserved, and the original wood floors were refinished. Entirely new electrical, plumbing, heating, and communications systems were seamlessly integrated. The attention given to the small details is what gives the project its defining character. Gas-powered brass wall sconces were rewired, restored, and reinstalled. A marble vanity that had been home to roosting pigeons was cleaned and reinstalled in the half bath. Historic doors that had been removed due to floor plan changes were repurposed as sliding barn doors. Original glass in the historic windows was retained and cleaned, and a wood and glass display case that had been sitting on the third floor, unused for decades, was repurposed as a dramatic chandelier above the kitchen island. Architect & Developer: PoMo & Co. 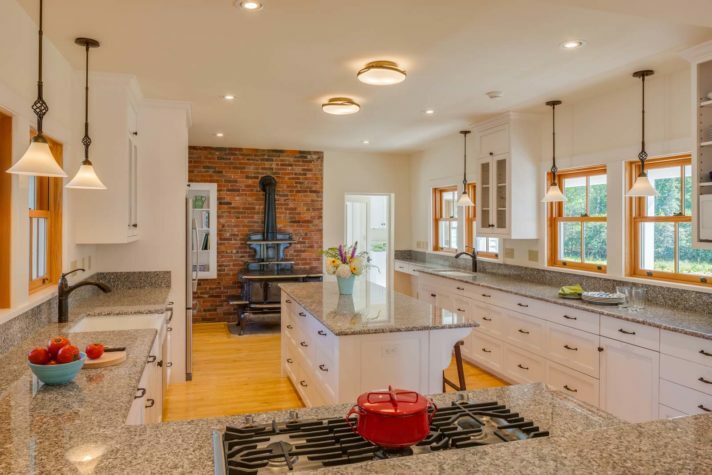 The clients chose BrightBuilt Home’s Little Diamond design because they felt that it captured the classic aesthetic of a New England Cape with a twist of modern spaces and finishes. Simultaneously unimposing but a little bit grand, the design strikes a balance between the old and new, melding coastal vernacular with innovative building ideas. Located in the coastal town of Tenants Harbor, the 1,900-square-foot home has a one-and-a-half-story window wall in the main living spaces that displays magnificent views of the surrounding wilderness and maximizes the sun’s potential to bring light and warmth inside. The home is designed to produce as much energy as it consumes, thanks to components such as well-insulated wall and roof assemblies, efficient mechanical systems, and a photovoltaic array. During the winter months, this home can be heated during the day by just the sun. 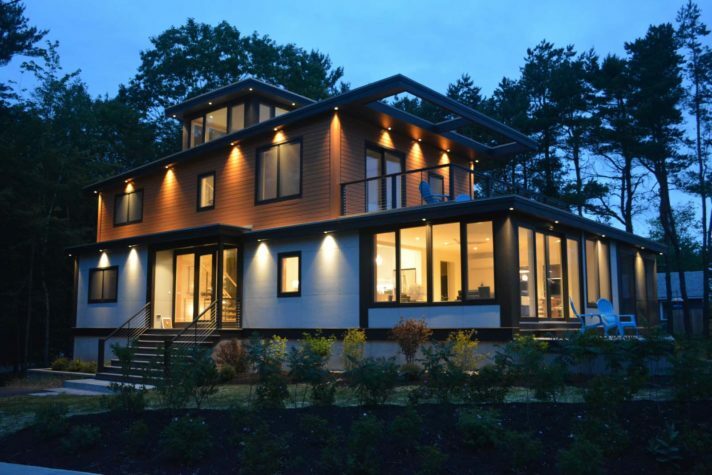 Furthering BrightBuilt Home’s commitment to conscientious design and construction, the home was built off-site, ensuring that it was protected from the elements and minimizing building waste. This new 20,000-square-foot dining facility at a summer camp seats 500 and contains a large commercial kitchen that supplies nearly 2,400 meals a day. The building replaces the original dining hall, which the camp had largely outgrown. An adjacent pavilion, designed and constructed at the same time, provides sheltered outdoor eating and gathering space. The entire facility is also designed to host functions before and after the regular camp season. 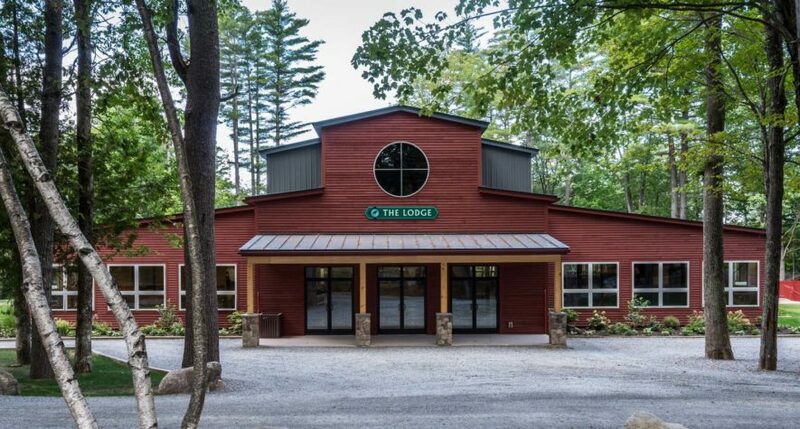 The building is carefully integrated into the existing camp, which is located next to a lake in the woods. 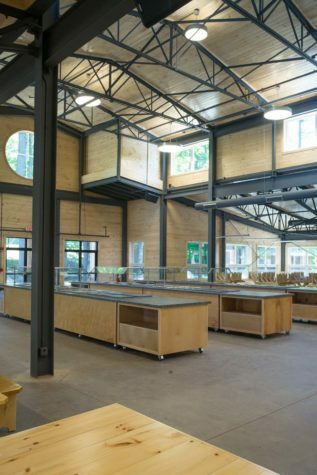 Although the new dining facility is only months old, it was carefully sited so that it looks as though the adjacent mature trees grew up around it. 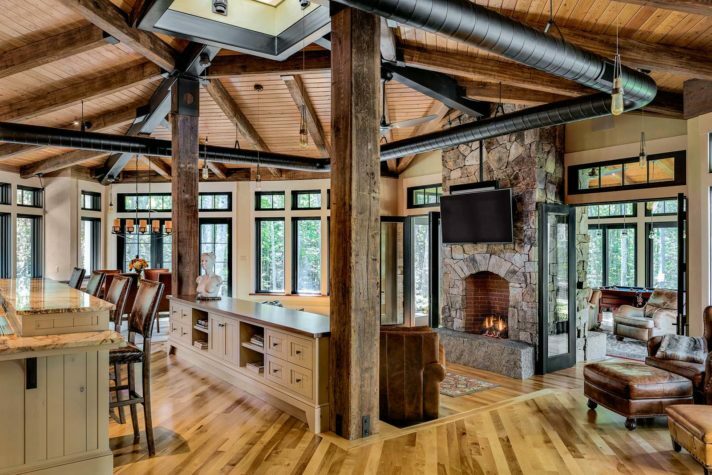 Windows around the dining area frame views of the surrounding woods and playing fields. The arrival sequence and internal circulation were carefully studied to create a pleasant flow and minimize conflicts. High windows bring daylight into the middle of the building. Inside, the steel structure keeps the space light and airy and, contrasting with natural wood on the walls and ceiling, adds visual richness to the interior experience. Aura is the transformation of a 1960s-era nightclub into an expanded and rebranded performance venue in the heart of downtown Portland. Located within a historic district, Aura’s design grounds the building in strong, existing masonry elements and contrasts it with a modern form highlighting the event space. A large aperture in the main event space creates transparency from the sidewalk to the venue. 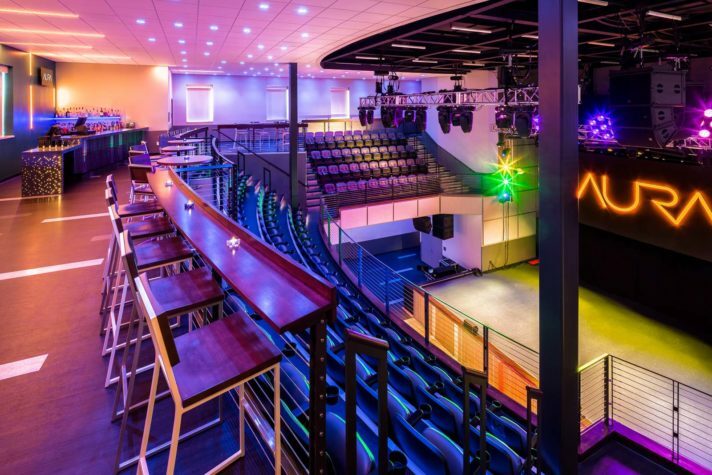 The 9,000-square-foot addition and renovation to the existing 15,000-square-foot space doubled audience capacity, allowing Aura’s owners to attract a greater variety of touring artists. New amenities such as two prefunction areas, as well as renovations to the existing sports bar and dance club, create flexible spaces for meetings, celebrations, and concerts. This project also brings patrons state-of-the-art audio, lighting, and video technology with remarkably little sound emission during concerts. To improve the sight lines of the existing space, the stage was raised up four feet, and a tiered approach was taken on the first floor, allowing patrons to see over the people in front of them. A horseshoe-shaped balcony level with direct views to the stage was also added. Correspondingly, performers enjoy an unusual sense of intimacy with the audience. A concept of “musical frequency meets architectural rhythm” spans all design aspects of the building and interiors, from the undulating windows to floor and lighting patterns, tying together this dynamic space with the constant interplay of light and movement. It took five years of permit agency negotiations to find a mainland base for utility connections to the Inn at Cuckolds Light, located on an island half a mile offshore. Once the mainland utilities were installed, the small 0.62-acre parcel was made even smaller by utility easements and shoreland restrictions: only 5,520 square feet of buildable area remained. 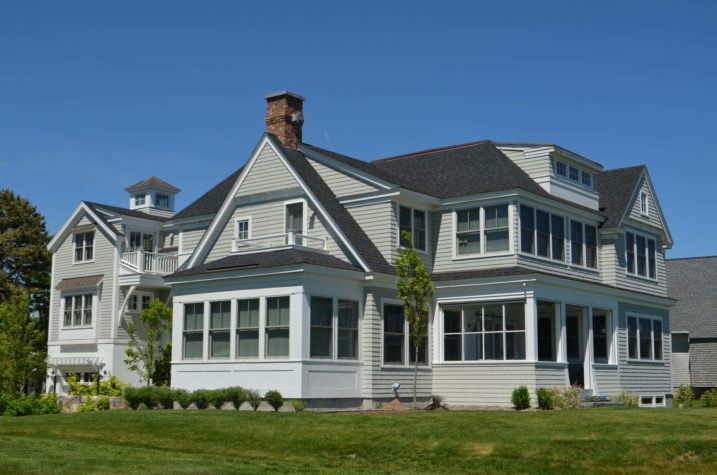 Knickerbocker Group efficiently designed a traditional Maine compound, capturing the expansion potential in a grandfathered main house and guesthouse, and siting a new barn for use by the sea captain who manages the offshore inn. All three buildings are positioned to take in spectacular views of Cuckolds Light and maximize privacy for guests. The main house sits on the water’s edge. The lower level, formerly an enclosed storage space with a dirt floor, was converted into an elegant open-air room with a cedar ceiling, porcelain tile floor, stone fireplace, and mahogany-framed screen panels between shingleclad columns. The materials were selected for warmth and beauty as well as weather resistance, since storm surges will inevitably reach the home and flood the FEMA-compliant foundation below. On the main level, the living areas encircle a central fireplace, finished with plastered concrete and integrated firewood storage made of diamond-lattice steel. Pickled fir beams and columns delineate the individual spaces while unifying the living areas. The winding stairway offers an open visual connection among the three floors. At the guesthouse, the small footprint necessitated a layout as open and airy as possible, accentuated by numerous windows with large panes to take in expansive views and flood the intimate space with light. The barn serves as the office for the sea captain and a lounge for arriving guests to relax in before boating to their island retreat. As a whole, the compound embodies the classic detailing of a traditional Maine farm, with elegant finishes in hues of blue and gold that contribute a nautical edge. Tile: Old Port Specialty Tile Co. Located on Portland’s Longfellow Square, a very active public space rich in history, the Hiawatha is an eight-story high-rise. The mixed-use project consists of retail and structured parking on the ground level and 139 market-rate apartments on the floors above. In addition to helping define the western street edge of the square, the building design bridges the past and the present by mixing a traditional brick facade with metal siding. The building’s shell uses an innovative insulated panel system that provides a high insulation value to minimize energy use. It was designed and constructed on a site with zero setbacks, maximizing its development potential and requiring a high degree of precision during construction. The result is a high-density, urban infill project that provides energy-efficient modern living spaces. About a block away from the beach in Saco, an old cottage had an angled view down the street. It also had insulation, mechanicals, and a structure that were not worth saving. 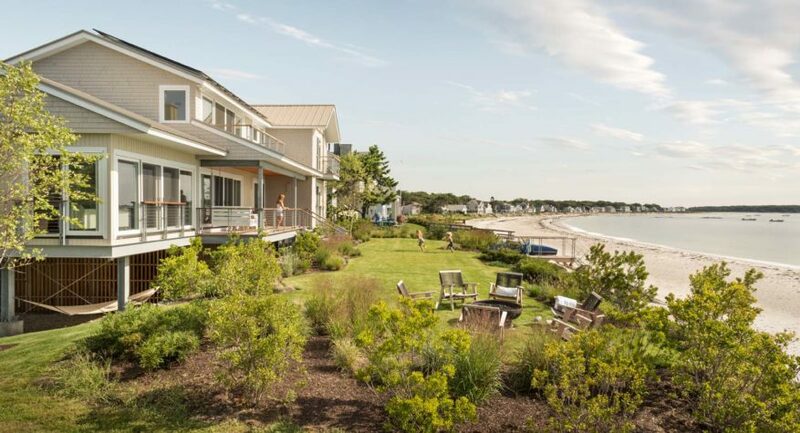 The client had grown up spending summers in the quaint seaside neighborhood, which has several older cottages and an old camp-style inn; his parents still live in the house across the street. The new home began around a desire to have an open living/dining/kitchen space on axis with a view to the beach, which became known as “the coffee view,” says architect David G. Johnson of Skaala Architecture. By cranking the house on its site, they were able to take advantage of the view, while also setting up a dynamic, angled relationship to the street and passersby. 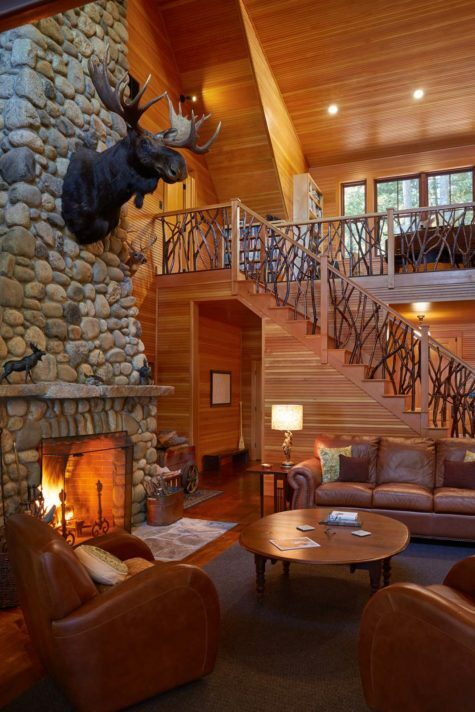 The house also accommodates four bedrooms and an office loft around a central, open staircase. The latter serves to connect the whole house physically and visually and becomes a sculptural take on the union between vertical and horizontal geometries. Five steel tube columns run three stories from the basement up to the turret/loft, while downturned steel channels are welded in between the columns as brackets for each tread. The result is a very open and flowing staircase that also allows vertical ventilation, creating a stack effect up through the house on hot days. Low maintenance and energy efficiency were also top priorities. Skaala Architecture used double-stud wall construction, hybrid closed-cell foam/dense-pack cellulose insulation, smart air barriers, and triple-pane windows to achieve a very efficient shell. Cement panels and acetylated wood siding offer a very low-maintenance exterior. The finished summer cottage now has maritime flavor and a modern presence, with durable materials and flowing spaces. Situated on a knoll that consists of ledge outcroppings and mature trees, this 3,500-square-foot residence is on a densely wooded 18-acre lot surrounded by wetlands. 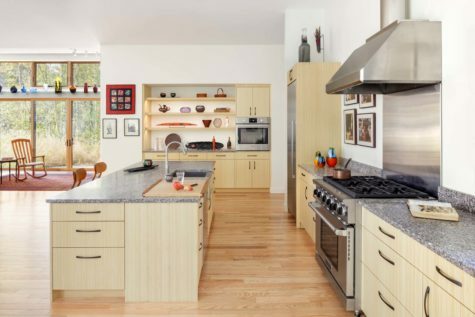 The clients wanted a home to mirror the way they live—organic, clean, and simple—and be a reprieve from the hustle and bustle of their fresh produce company. The goal was to create a home filled with natural light and flexible spaces and with a seamless transition from indoor to outdoor living, integrating and celebrating the wooded landscape and native flora while minimizing the use of fossil fuels. It was important that the interior finish materials—a mix of brick, stone, reclaimed timbers, and steel—be diverse and true, resulting in a design that blends state-of-the art mechanical systems with a rustic and industrial feel. The exposed building materials and structure define the home’s character and provide ornamentation of the interior spaces. 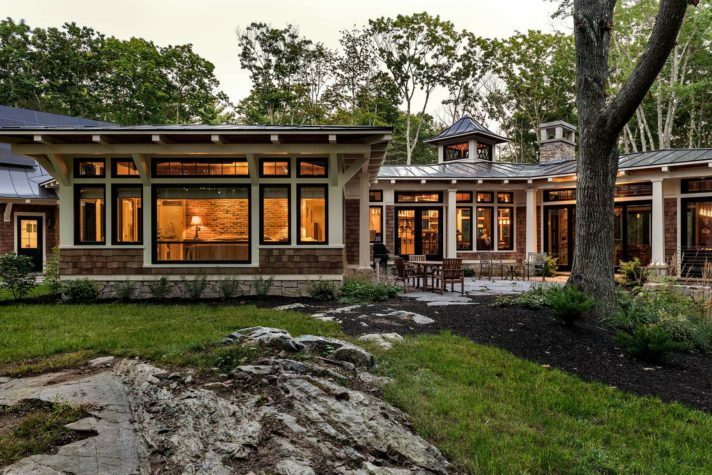 Wide and tall spans of glass windows and doors as well as a large, central cupola provide light, natural ventilation, and panoramic views to the wooded setting, and a cantilevered, four-season sunroom feels almost like a tree house set within the landscape. Sustainable features include large overhangs, structural insulated panels on the roof, photovoltaic solar panels, and geothermal radiant heating and cooling, as well as native plantings and a fine fescue lawn that requires less water. The current average energy cost is less than $50 per month. It was the owners’ drive for low site impact, their passion for Passive design techniques, and their love of nature that ultimately established this relaxing retreat.